Payment Plans have been shown to increase conversions by nearly 18% (source), and Podia makes offering payment plans easy. Offering Payment Plans makes it easier for your customers to afford your courses by letting them pay smaller installments over time, rather than in one lump sum. As long as you’ve connected your Stripe account, you can now set up a Payment Plan for any online course. Here, you can set a price per payment and the number of monthly payments you want your Payment Plan to have. Customers will be able to choose between paying the "one-time payment" price and enrolling for the Payment Plan. Want to see Payment Plans in action? 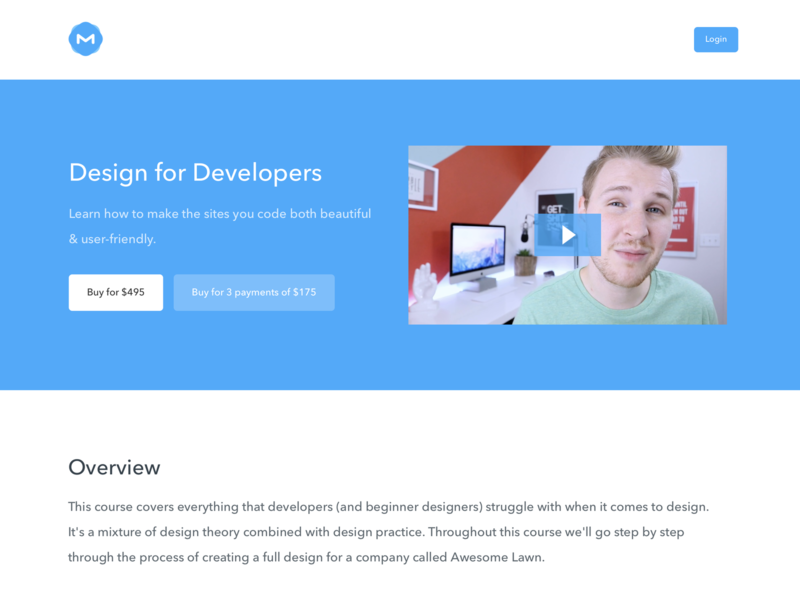 Check out Mackenzie’s Design for Developers course. How do failed charges get retried? We retry the customer's card on file 3 times, 3 days in a row. If the charge fails after the third attempt, the subscription is then cancelled. PayPal updated their API at the start of this year, and we need to update the version of the API we use for PayPal before we can support Payments Plans for it. We’re starting work on updating the PayPal API next week, and then once that’s done, we’ll be adding support for Payment Plans paid with PayPal in addition to Stripe.